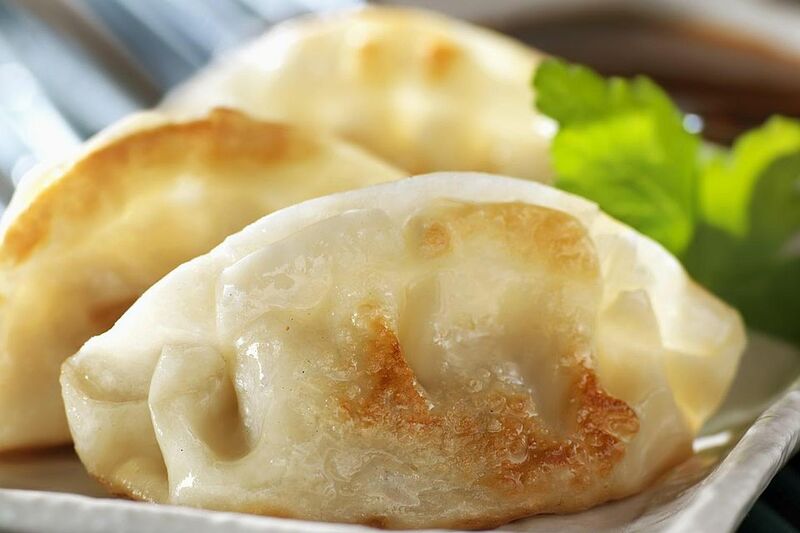 Chinese dumplings (Jiaozi) are a rather popular dish during the Chinese New Year season. This is a fantastic recipe to make if you want to impress all of your family and friends the next time you're going to a holiday party. Stir the salt into the flour. Slowly stir in the cold water, adding as much as is necessary to form a smooth dough. While the dough is resting, make the filling; add the soy sauce, salt, rice wine, and white pepper to the meat, stirring in only one direction. Add the remaining ingredients, stirring in the same direction, and mix well. To make the dumpling dough, knead the dough until it forms a smooth ball. Divide the dough into 60 pieces. Roll each piece out into a circle about 3 inches in diameter. Place a small portion (about 1 level tablespoon) of the filling into the middle of each wrapper. Wet the edges of the dumpling with water. Fold the dough over the filling into a half moon shape and pinch the edges to seal. Continue with the remainder of the dumplings. To cook, bring a large pot of water to a boil. Add half the dumplings, giving them a gentle stir so they don't stick together. Bring the water to a boil, and add 1/2 cup of cold water. Cover and repeat. When the dumplings come to a boil for the third time, they are ready. Drain and remove. If desired, they can be pan-fried at this point.